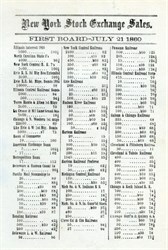 Original (Not a reproduction) Historic Price Quotation Sheet from the New York Stock Exchange issued in 1860. 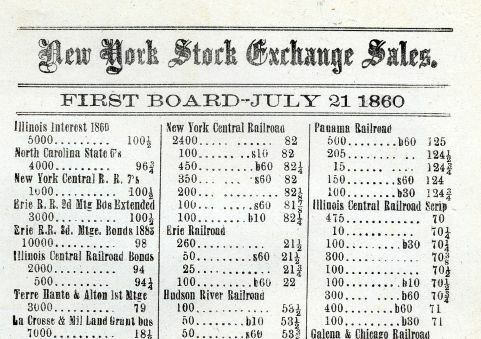 This historic document shows the "First Board" prices of stocks listed on the New York Stock Exchange. The First Board represented trading from 10:30am to Noon. (The Second Board represented trading from 2:30pm to 3:00pm) This item is over 156 years old, with various dates throughout 1860 and would look terrific framed. This closing price summary was printed on a daily basis and sent to brokers and Wall Street firms.